Manafwa and Namisindwa districts will soon start enjoying safe water thanks to National water and sewerage corporation (NWSC). This follows the commissioning of the Lirima Gravity Water treatment plant by President Yoweri Museveni. The plant will serve over 78,000 people in Manafwa and Namisindwa district in Eastern Uganda. 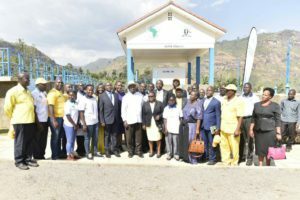 The water scheme was constructed by the Ministry of Water and Environment ,funded by the Government of Uganda and the African Development Bank. In May 2016, the Ministry of Water and Environment handed over the water supply scheme for efficient management to NWSC. Following the take over, NWSC embarked on aggressive network extensions to serve more people in Manafwa Sistrict. Some the interventions done since take over include 3kms of water mains extension to serve over 226 people in Lwakhakha town centre. The others are; 10kms of water mains extension to serve over 300 people in Butiru-Nambale, 2kms of water mains to serve over 200 people in Mufutu-Maresi, 1.6kms of water mains from Mufutu to Makenya to serve over 150 people, 1km of water mains to serve over 100 people in Buvuma ward, Kayunga- 1.5kms, Namikhoma- 2.5kms, Butelumani-3kms, Sikayi-2kms, Bamayeku- 2kms, Bukhalungu-1.5kms, Green Valley- 1.5kms, Kibayi-3kms and Namweile- 2kms. In addition, over 40 public water points have been installed to serve Bumbo town centre- 15 water points, Serekere- 5 villages, Bunyuza TC- 15 water points, Maala Town Center- 02 water points, Lwakhakha town centre- 1 water point, Namboko town Center- 2 water points and Sikhana- 1 water point. At the moment, NWSC has extended its footprint from 23 towns of operation in 2013 to now over 226 towns. 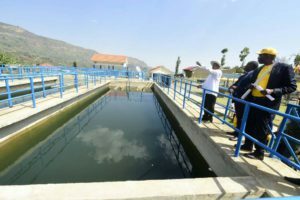 The corporation, working with the Ministry of Water and Environment and the government of Uganda recently rolled out a programme #SCAP100 with an aim of extending water to over 12,000 villages in Uganda. Speaking at the commissioning ceremony, President Museveni urged the people of Manafwa to protect water sources and the environment. “The earth is our mother and the environment is the clothing. Everytime we destroy the environment, we are unclothing mother nature!” he cautioned the residents.